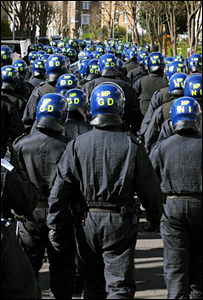 Hundreds of police officers raided 19 premises on a London street as part of a crackdown on crime. Some 600 officers sealed off part of Blackstock Road in north London to carry out the raid on Thursday. Surveillance showed evidence of drug dealing, the sale of stolen goods and a trade in forged documents, police said. Earlier, 500 officers raided 37 addresses across the country, as far north as Leeds. There have been more than 70 arrests in the two operations. Blackstock Road, on the borders of the London boroughs of Islington, Haringey and Hackney, is a popular shopping street. A Metropolitan Police spokesman said the massive operation, codenamed Mista, was an attempt to make a "clean sweep" of criminality in the area. He said officers had so far seized more than 350 stolen items including 120 laptops, 110 cameras, 32 iPods, 20 sat-navs and 47 fake passports and driving licences. The spokesman said: "There is no doubt that people know they can get rid of stolen goods in this particular road. "That is why we are doing a clean sweep to clear it out." The operation involved officers from the Metropolitan Police, City of London Police, British Transport Police and the immigration service. Ch Supt Bob Carr said they were still tracking down other suspects following the raids. "The operation has taken many months in the planning and collating intelligence to ensure that we are targeting the right individuals," he said. "We cannot allow people perceived to be successful through their criminality to have a negative impact on our communities, in particular young people. "This is part of a long term strategy to ensure those intent on criminal activity no longer gravitate towards the area."